Divorce is a painful word – something you really don’t even want to think about, but if it is inevitable, you want to keep it civil – especially if there are children involved – and navigate the divorce as quickly and at the lowest cost possible. We’ve all heard the horror stories of a nasty divorce and its effects on the families involved, as well as the costs involved – $20,000, $30,000, $50,000 and up! Keila Gilbert, Esquire, founded Alpha Center for Divorce Mediation 17 years ago after her own painful divorce, knowing that there had to be an easier, less painful, lower cost option to divorce. 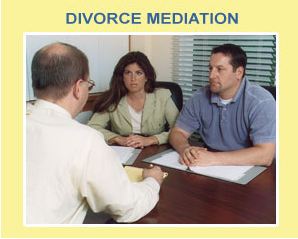 And there is: Divorce Mediation. Recently I had the pleasure of meeting with Scott Rudolph, Executive Director of Alpha Resource Center, LLC, to talk to him about some of the ways they help people. Scott is a Bucks County native, having grown up in Hilltown. He joined Alpha Center in 2009 and it’s evident he’s proud to be associated with this cutting edge divorce mediation firm. They have 12 locations to serve you, and they believe in a holistic approach from a team of professional attorneys, therapists, accountants and financial advisors to help couples not become one of those expensive, ugly statistics. I couldn’t help but notice how passionate Scott was about what they do – they really do want to help people! They are actually in the process of setting up a scholarship for couples who want to pursue marriage counseling but currently can’t afford it. I have to tell you, I was stunned! Scott also wanted me to make sure people knew that it doesn’t end with the decree – Alpha is there to help their clients move forward and have a successful new beginning. 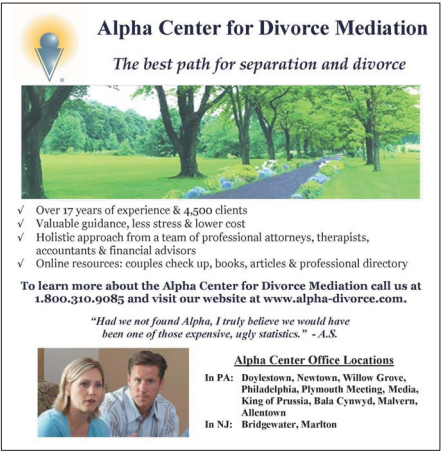 Alpha Center for Divorce Mediation is a member of the Central Bucks Chamber of Commerce. Nice to know there’s a less painful way to navigate one of life’s biggest challenges. This entry was posted in Bucks County, Bucks County Attorney, Bucks County Local Paper, Counseling, Divorce Mediation, Women's Magazine, Women's Newspaper and tagged couples counseling, divorce, divorce mediation, divorce toolkit, life after divorce, surviving divorce, therapy. Bookmark the permalink.